Former militants are offering to help security forces combat what appears to be a surge in piracy and kidnapping in the Niger Delta. This comes after a report that the government pays other former militant leaders millions of dollars yearly to protect the oil pipelines they used to attack. ”Peace” in the Niger Delta is an expensive balancing act, and the people that keep it regularly change alliances to maintain the calm or make the most of the funds. Between 2003 and 2009 it was an all-out battle in the Niger Delta. Militants say they were fighting oil companies and the government for the people’s share of Nigeria’s considerable oil wealth. Foreign oil giants and the government extract more than 2.5 million barrels of crude oil daily from the region. In 2009, the government rolled out an amnesty program, investing tens of millions of dollars in paying fighters to lay down their weapons and get job training. Since then, former militants – or freedom fighters – have jockeyed for a larger share of the amnesty funds, now hundreds of millions of dollars a year. Last month, The Wall Street Journal reported that individual former militant leaders are beingpaid between $3.8 million and $22.9 million a year to protect the oil infrastructure they used toattack. Not all militant leaders have been so lucky. 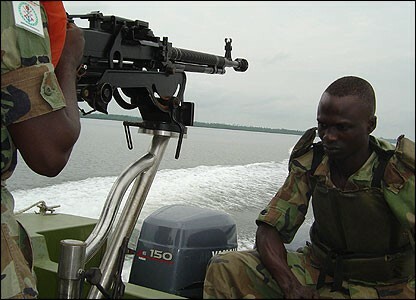 Captain Mark Anthony is a spokesperson for the Niger Delta Liberation Front, a group that claims to be operational, but not currently fighting. In June, Anthony said his group was preparing for battle and demanded more than $6 million to keep the peace. He now says the government should pay him and his men to protect communities from a new crime wave that the Nigerian police say includes 32 kidnappings in August alone. Casely Omon-Ihabor is a lawyer who represents Anthony’s group. A few months ago, he railed against the government, saying it had paid off some militants to make peace, but had done nothing to fix the issues they were fighting for. In recent months, though, he says kidnapping and armed robberies have become near-daily events and this has changed his mind. Now he wants the group to help the government fight criminals so the government can focus on development. Nigerians are generally fond of sayings – like ”it takes a thief to catch a thief” – and many agree with this logic. Others, however, think the whole idea of paying former militants to fight crime is absurd. Edward Oforomeh is another lawyer in Warri, a run-down oil city in the Niger Delta known for frequent kidnappings.He said the government should spend more money equipping their security forces and none toward paying former militants. Oforomeh said the Nigerian police have the capacity to fight crime, but lack training and equipment. He said re-arming the same groups that created chaos in Niger Delta years ago would just re-create the chaos. This entry was posted in AFRICA PARTNERSHIP STATION, AFRICAN ARMED FORCES, ARMED CONFLICT, BUNKERING, COUNTERINSURGENCY OPERATIONS, GLOBAL DEFENCE NEWS, GULF OF GUINEA, JOINT(MILITARY)TASK FORCE IN THE NIGER DELTA, MARITIME SAFETY AND SECURITY, MILITARY HARDWARE, MILITARY PHOTOS, NIGER DELTA CONFLICT, NIGERIA, NIGERIA POLICE FORCE, NIGERIAN ARMED FORCES, NIGERIAN MILITARY HISTORY, NIGERIAN PARAMILITARY FORCES, NIGERIAN SPECIAL FORCES, PIRACY, RISK ANALYSIS, SECURITY ISSUES AND CONCERNS, STATE SECURITY SERVICE, TERRORISM, WEST AFRICAN STANDBY FORCE and tagged BUNKERING, DEFENCE AND SECURITY, GEOPOLITICS AND STRATEGIC STUDIES, GULF OF GUINEA, JOINT TASK FORCE - OPERATION PULO SHIELD, MARITIME GUARD COMMAND, NIGER DELTA CONFLICT, NIGERIAN AIR FORCE, NIGERIAN ARMED FORCES, NIGERIAN ARMY, NIGERIAN MARITIME ADMINISTRATION AND SAFETY AGENCY(NIMASA), NIGERIAN MILITARY HISTORY, NIGERIAN NAVY, PIRACY, TERRORISM. Bookmark the permalink. Eventually TRAGICALLY this gravy TRAIN WILL COME TO AN END what are we on the third ammnesty the total number of people who feel AGGREIVED is beginning to cast serious doubt on the whole process. Mr. Edward Oforomeh, in this article, in right on the money. Equip the police, and the security forces, so they can do their damn job. Did anybody consult any of the generals that led JTF wars in the delta ? Did president GEJ consult major general lawrence Ngubane or major general Yaki- sarkin Bello, before he decided to hand out cash to these militants, with no strings attached ? Is the nigerian military or are our special forces supervising the organisational structure and the conduct of these militants turned businessmen ? or is the government just dumping cash on them, hoping they would just go away. If these militants don’t observe a credible “STICK” from the government in the form of a security presence equipped with over a hundred transport and attack helicopters, and armored gunboats, swift boats, amphibious APCs numbering in the thousands, they would simply escalate the problem, and extort the government for more and more money. Kudos to any of the former militants, who want to contribute to law and order. As no development would take place in the current environment. The niger delta finally has a native son in Aso rock, who would at least have a sympathetic ear to the plight of people in the region. These so called freedom fighters, thru their individual greed, are on the verge of snatching defeat from the jaws of victory.